*Today was full of a lot of exciting things. *After walking with Nikki and Butters this morning (yes, I did make it up this morning!! ), I came home and started preparing for my VIPKids interview. My interview was scheduled for 11:30 a.m., and you can get into the teaching portal about one hour before hand to make sure your equipment is working correctly. For some reason the microphone on my headphones was not functioning. I tried all kinds of troubleshooting. Then I found the manual for the headphones online, and realized I had plugged the device in wrong. Oops!! It was an easy fix after figuring out the correct way to plug it in! *My interview lasted about 30 minutes. Rye was my interviewer, and he talked to me for about 10 minutes, then I did the demonstration classroom for 10 minutes. He pretended to be a five year old Chinese student. Then he gave me feedback for about 10 minutes. I passed the interview with a 100%. In the next ten days, I need to complete 8 teaching modules and quizzes, do one or two Mock Classroom, and then sign a contract. Once all this is complete, I can begin scheduling sessions to teach. I am very excited!! I completed four of the eight modules this evening, and will finish the next four tomorrow. *After lunch I went over and spent the afternoon with Christy and Everett. Christy continues to recover well from her knee replacement surgery. She is getting around good with her walker, and she said she feels very steady. We watched another episode of Boise Boys while I was there. It is a fun show, because I am familiar with the area, but I am amazed at the prices they sell the houses they renovate. It is kind of crazy!! *Paul arrived home just as I was arriving home. We walked over to Furniture Exchange to get some information on buying paint for the painting job we are tackling, which is painting the exterior of our house next week. Then we walked over to Excelsior Cycle to purchase two new bikes. The last time we purchased new bikes from Mike Domy at Excelsior Cycle was in 2001. When we moved to Kellogg in 2000, a trailer that was hauling some of our items caught on fire, and we lost both of our bikes, so, with the insurance money, we purchased two mountain bikes the next summer. So we thought, after 17 years, it was time trade those two mountain bikes in and purchase two new bikes, and take advantage of the beautiful Trail of the Coeur d’Alenes that is located practically in our front yard. We took a couple of bikes out for a spin last Thursday from Excelsior Cycle, and both of us loved them!! I asked Mike what kind of bikes they were. 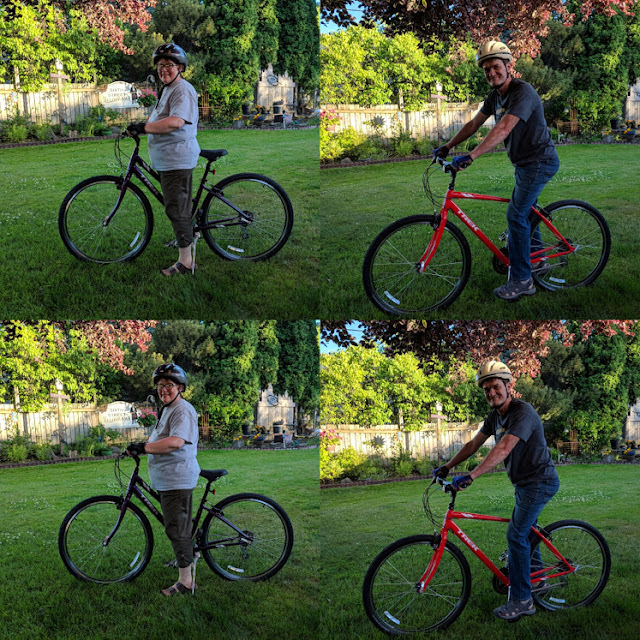 Mine is a Comfort Hybrid bike, and Paul’s is a Sport Hybrid. We took a ride out on the bike trail to Smelterville and back. And, in doing so, I discovered my Fitbit Flex has a way to track my bike ride on a map, how many miles I traveled, my average MPH, calories burned, and my heart rate. That was pretty cool to see all that when I returned from the ride. *In case you are unfamiliar with the Trail of the Coeur d’Alenes, here is a description: The Trail of the Coeur d' Alenes is a 72-mile paved trail spanning the Idaho panhandle between Mullan and Plummer. It was created through a unique partnership between the Coeur d'Alene Tribe, Union Pacific Railroad, the U. S. Government, and the State of Idaho. The trail begins in the historic Silver Valley, continues along the Coeur d'Alene River past scenic Lake Coeur d'Alene and through rolling farmlands to Plummer. Twenty developed trailheads provide entry points, and there are seventeen scenic waysides along the route for picnicking. If y0u would like more information, you can click here.